In this buyer’s guide, we’ll review 9 of the best disc golf baskets on the market in 2019, including portable and permanent options. We’ll also outline some key things to consider when buying, so that you can find the right basket to practice your putts. First, we’ll take a look at 7 of the best portable disc golf targets on the market right now. 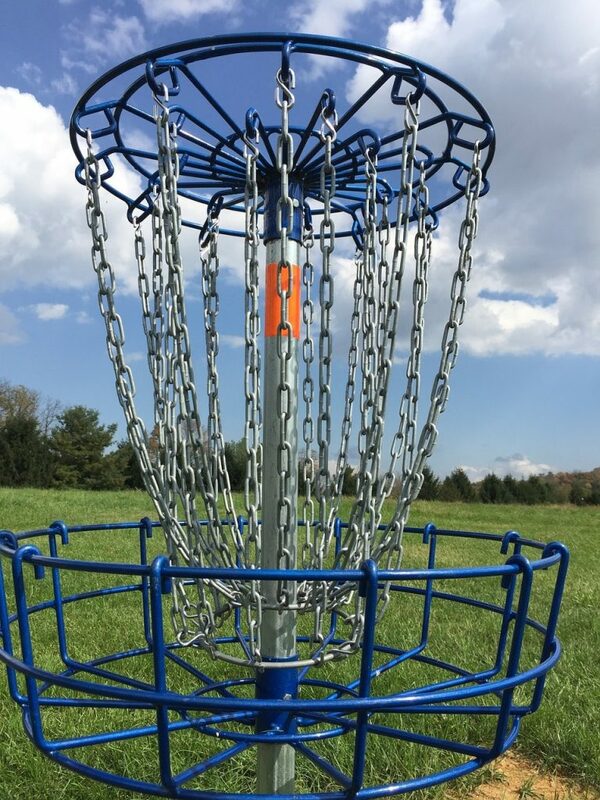 This is one of the few PDGA approved baskets out there that’s actually quite easy to move around. When disassembled, it’s about the size of a car tire, so you shouldn’t have any problems taking it to events or the local park. You can even put it back together without any tools. Even though the association classifies the Black Hole Pro as a Basic level target, the chains are pretty heavy-duty – you get 24 of them. As a result, it’s fairly heavy. However, the number of chain strands means you’ll experience fewer blow-throughs and more consistent putts. This means you can practice your short game with a basket that performs just like the ones at B and C-tier competitions. What’s more, because the entire target is made of metal, this basket is incredibly durable. The chains are zinc-plated, meaning they can withstand harsh weather conditions without rusting or corroding. Another benefit of having such a sturdy target (with a large base) is the fact that it’s highly unlikely to fall over or wobble in high winds. Considering what you get, the price of this basket is fairly reasonable. If you’re looking for something all-metal that performs just like the targets you’ll be using at events, it’s hard to go past the Black Hole Pro. Small when disassembled – easy to transport. Bit heavy for a portable target. If you’re going camping or love to play disc golf at the beach, a proper all-metal target is probably going to be a bit too heavy to carry around with you. Fortunately, Innova makes a portable version of their legendary DISCatcher target. The company has saved weight by going for a fabric basket and rim, and using fewer chains. As a result, the final weight of the target is only around 15lbs, and it’s about the size of a folding camping chair when packed away. You can fold it down and set it up in no time at all, and it even comes with a carry bag, which proves to be very useful on outdoor adventures. But how does it actually perform? Since there’s fewer chains, you might experience a few more pole bounces than you would with a regular basket. However, Innova really knows their stuff – the size of this target is perfect, and it still catches putts really well. You could even use it for backyard practice if you wanted to. Since the DISCatcher Traveler is priced very reasonably, the only thing we can fault it for is its durability. Obviously, metal targets are going to withstand sun, wind and rain better than fabric/metal composite baskets can. You’ll need to store this target in your house, garage, shed or car when you’re not using it. Super easy to put up, take down, and carry around. Catches discs surprisingly well for a light-duty target. Not incredibly durable compared to metal baskets. For some players, the foldable baskets just don’t cut it. They simply can’t offer the same feel that metal targets have when putting. If you’re one of these people, Driftsun sports makes a light-duty steel basket that’s very portable. It has fewer chains than most other options out there, which helps to reduce weight. It’s also super easy to setup – you can have it ready in less than three minutes once you get the hang of the assembly process. The downside to a target with relatively few chains is the number of bounce-outs. 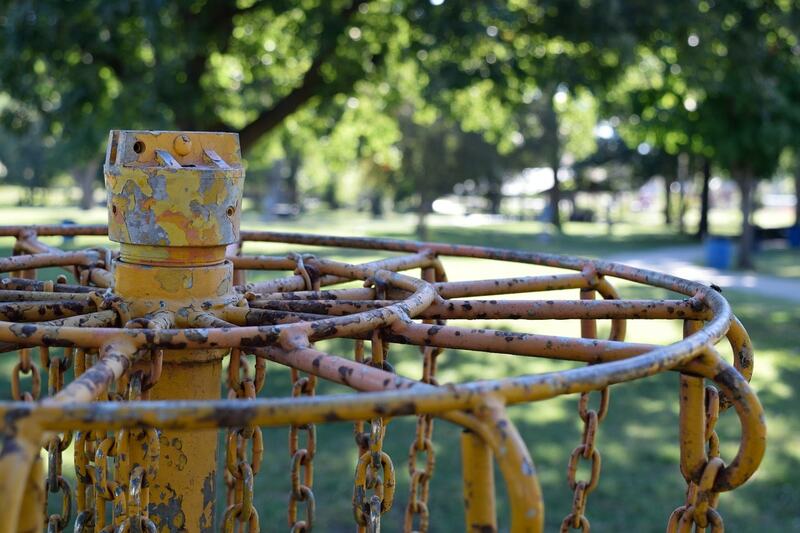 You might experience discs running through the chains on occasion – this target doesn’t match the performance of PDGA approved baskets. If you want to fix this down the line, you can always add more chains to the inside rim. Driftsun’s target is still definitely worth considering though. It’s reasonably priced, and is also very durable. The pole is coated in zinc and the chains are galvanized, which means you can leave it outside without the basket being worn down by wind and rain. Very light, easy to setup. Low number of chains means you’ll get the odd spit out. This is essentially a better-performing but slightly more expensive version of the Driftsun portable target we just reviewed. To reduce the number of blow-throughs, Discraft has installed thick, heavy-duty chains, of which you get 24. As a result, this target is definitely heavy-duty, despite the company calling it “Lite”. Discraft’s product achieves a good balance between performance and portability. You can practice putts at home with a target that works just like a PDGA-approved practice basket. However, you also have the option to take it apart, put it in your car, and have a round or two at the local park – no tools are required for assembly/disassembly. Since the base is quite large and very sturdy, you won’t have any issues with the target wobbling in the breeze. The chains and pole withstand rusting nicely but can also handle snow and frost, so you can leave it outside during winter no matter where you live. The best thing about this basket though is its price. Considering how well it performs for practice, it’s excellent value for money. If you need a portable target with heavy-duty chains to train your short game, it’s hard to go past this basket. Very few pole bounces or spit-outs. N/A – excellent target for practice. For beginners and young families, it’s probably not worth spending $100-$150 on a disc golf basket. However, the foldable options on the market at the sub-$100 price point are often poor quality. This Yaheetech target is a possible solution to this problem. Since it’s made of painted, rust-resistant metal, it’s very durable. Plus, the base is nice and big, so it won’t tip over when hit with strong throws at close range. Despite how sturdy it is, this is one of the cheapest metal baskets on the market right now. You only get 12 chain strands though, which means you’ll get a few more blow-throughs than you would with a heavy-duty rig. On the plus side, this makes the target super lightweight. When disassembled, the basket is very compact, meaning it’s easy to pack in your car and take to the beach or park. Overall, for casual players on a budget, this is a fantastic pick. If you decide to begin playing disc golf competitively however, you’ll probably want to upgrade to something that’ll do a better job at catching your putts. Only 12 chains – can get the odd pole bounce. Another foldable umbrella-style target is the portable version of the DGA Mach Lite basket. This is a similar option to the Innova DISCatcher Traveler we looked at earlier. Like the aforementioned product, the Mach Lite is very light (25lbs), and has a foldable basket. It also comes with a carry bag which has a shoulder strap, making it super easy to move around. Setup and take down is also very easy, so you can get more practice in during each putting session. However, the Mach Lite is fairly expensive – it’ll cost you more than some light-duty all-metal targets. It’s quite durable, but you wouldn’t want to leave it outside overnight in harsh weather conditions. Compared to the DISCatcher Traveler, the target area on the DGA Mach Lite is a little wider, which makes it easier to hit. If you’re looking for challenging putting practice, it might be a better idea to go for the Traveler. But if you want something that more closely matches the baskets you’ll be using at events, the Mach Lite is your best bet. The only other thing we can fault this target for (other than its price) is the legs: they can feel a little flimsy at times. However, they should be able to withstand strong winds without the basket falling over. Comes with a carry bag – very portable. Performs just like metal practice baskets. Legs can feel a little flimsy. If you need something for putting practice, it can be worth getting a narrower target. This way, you’ll get better at hitting the middle of the chains, rather than relying on the edges to snag the disc. The Marksman only comes with 15 chains, but if you’re able to hit the thin strand profile, the disc will fall into the basket nearly every single time. It’s also a fairly light target, meaning you could even take it to events to hone your short game in between rounds. However, this isn’t one of the more durable baskets on the market. Dynamic Discs say that it may begin to degrade if left outside for extended periods. Even though the chains are zinc-coated, it’s probably a good idea to bring this target indoors during the winter. Considering how well this basket works for training purposes, it’s pretty reasonably priced. After enough time putting with the marksman, you’ll begin to notice your scores dropping by a few points each match. Putting is where the game is won or lost really, so it’s definitely worth focusing on it in training. Narrow chain profile, excellent for training. Could be more durable – shouldn’t be left out in the elements. Now we’ll take a look at 2 of the best permanent disc golf baskets (that can be installed in-ground) available at the moment. There’s two great things about having a permanent disc golf basket in the backyard for practice. The first benefit is you can set it (in concrete) and forget it – no need to bring it in during the winter. The second advantage is how well these in-ground targets perform. Because they’re designed for use on proper disc golf courses, they’re meant to be incredibly sturdy and have very few spit-outs. The Patriot is one such example of an awesome permanent basket. Its chains, rim and pole are galvanized with a powder coated finish, meaning they can withstand numerous harsh winters before showing any signs of wear. Since you get 26 chains, this target seldom rejects your disc. 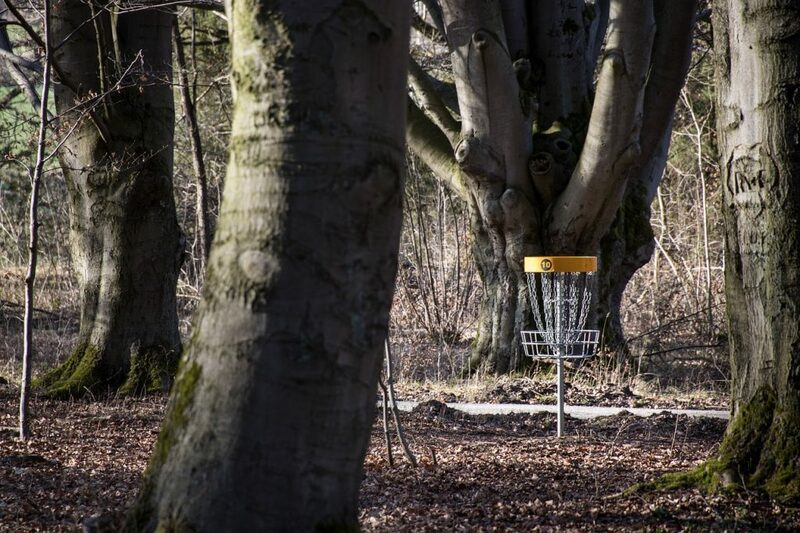 In fact, it’s PDGA approved at the Championship level, meaning it plays just like the baskets at A-tier and above events. What’s more, if you don’t want to concrete the Patriot into the ground, you can get it with a sturdy steel base (wheel included), which makes it fairly portable. If you do go for the permanent option though, you get a ground sleeve, locking collar, padlock, and handy installation instructions. As you’d expect from a heavy-duty target of this quality, the price is pretty high. However, you definitely get what you pay for. Tough galvanized finish – incredibly durable. 26 chains, meaning almost no blow-throughs or pole bounces. You can tell this thing is tough just by looking at it – the entire target, including the pole, chains, base and basket are galvanized. This protective layer of zinc is great in that it protects against rust and corrosion, ensuring your target will last for years to come. It’ll basically shrug off a snowstorm like a warm summer breeze. The company has used what they call “sliding link” chains, which are designed to prevent pole bounces. Since you get 18 chains in total, cut-throughs are pretty rare, meaning you can practice your putts without worrying about the target spitting out good throws. This basket actually comes with its own base, meaning you can use it as a portable option if you like. Although it’s fairly heavy, the Mach 2 is quite easy to assemble and disassemble with the right tools. To install it permanently, you’ll need to buy a separate conversion kit from DGA directly. All of the awesome features of this target come with a fairly hefty price tag though – this is a relatively expensive basket. However, if you’re looking for something super tough for your backyard or course that’ll last for years to come, the Mach 2 is worth the money. Performs just like event baskets – little to no spit outs. Can be used as a portable option too. Requires a separate kit for permanent installation. 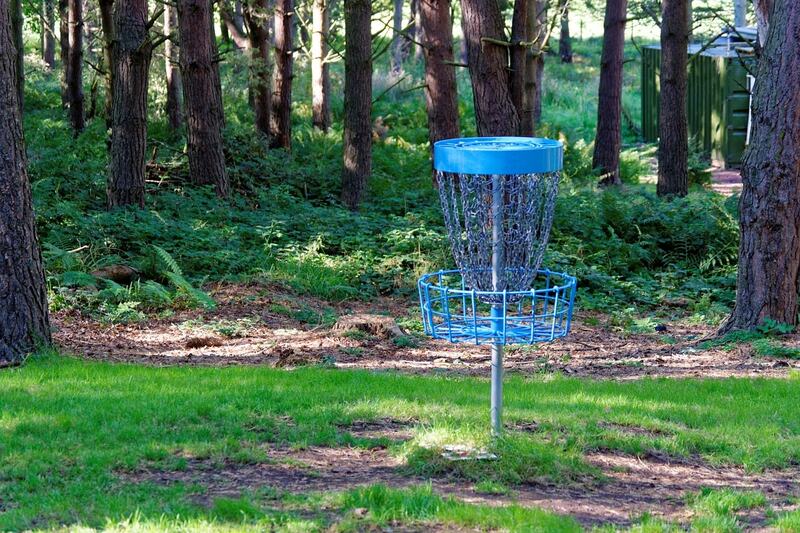 In this section, we’ll outline everything you need to know when buying a disc golf basket. You’ll need to choose a type of basket based on what you’ll be using your target for. Foldable baskets have a fabric catchment area that can collapse, making them very portable. They tend to be quite light, and often come with a carry bag. Narrow baskets have a thinner target area, which is great for practicing your putting. However, they take a bit of getting used to – you’ll likely be using wider targets at your local course. Regular baskets are your run-of-the-mill option. They are much easier to hit than narrow targets, but may be more expensive (depending on which type of you get). Regular baskets tend to spit out fewer discs, but can be much heavier than foldable targets. Heavy-duty baskets (a type of regular basket). As long as you get something that has a stand, baskets with many chain strands are technically portable. However, they will be quite heavy – you’ll probably need a decent amount of space in your car to move them. The upside though is that they better match the performance of the baskets you’ll be using at events. Light-duty baskets (a type of regular basket). Basically like a heavy-duty regular basket but with fewer chains, making it lighter. They’re much easier to move and cost less than heavy-duty baskets. Foldable baskets. Targets made of a composite of metal and fabric are incredibly easy to move, but aren’t usually very cheap. Foldable baskets will also fold down and fit in tight spaces in your car. However, they’re less durable than regular all-metal baskets and tend to spit out more discs than their traditional counterparts. While these portable options come with a stand (and sometimes a wheel), permanent options must be concreted into the ground. This can be a hassle, but it means you can set and forget your basket – meaning there’s no need to haul it inside during winter. Plus, in-ground targets are guaranteed not blow over on windy days. Remember, 90%+ of baskets on the market these days are portable. To get something that comes with a ground sleeve and is ready for concreting, you may have to go for a portable option and then buy the manufacturer’s in-ground conversion kit. Just be careful though that the basket you’re going to use is tough enough to withstand winter weather or rust from sea salt in the air. Look out for galvanized or powder-coated targets if you’ll be keeping it outdoors. Your disc golf basket (including a ground sleeve). First, dig a hole with ample space to pour concrete around your ground sleeve. The instructions that came with the target should specify exactly how deep it needs to be. Double-tape the bottom of your ground sleeve to prevent any concrete seeping in. Place it into the hole and carefully put the pole through the sleeve, avoiding piercing the tape at the end. Pour the concrete into the hole and add water as per the instructions on the packaging. Mix it with your spade, and fill the hole to just below ground level. Push your valve box (if you’re using one) into the concrete. Ensure that it’s offset from the pole, and allow enough room for the valve box cover to fit over the ground sleeve. However, don’t make it too high – we don’t want mowers hitting the cover. Attach your magnetic spirit level to the pole to make sure it’s perfectly straight, and adjust it if necessary. You can now remove the pole and place the cover on the valve box. Leave the concrete to set for as long as it needs (48 hours is a safe bet). After the time is up, you can install your pole if you’re ready to begin playing. Repeat as necessary for 9 or 18-hole courses. This is tiring work – be sure to take frequent breaks! What are PDGA approved targets? The Professional Disc Golf Association (PDGA) has a process whereby manufacturers can submit samples of their basket to the organization to have them approved for specific uses. This PDF document outlines the technical details of what’s required for a target to be approved on page six. Basic targets are meant for practice or casual play – most portable baskets fall into this category. They’re approved for use in leagues and X tier events. Standard targets are typically permanent options that are on the lighter-duty side. They’re approved for events up through B tier, but not A tier competitions. Championship targets on the other hand can be used in any events, including professional tournaments. There are incredibly strict requirements to be approved for this classification. To qualify, targets must be very sturdy and have heavy-duty chains. For serious players, nothing beats Championship targets. Since the PDGA rigorously tests the products it approves, it’s definitely worth going for something they’ve looked at if you can afford it. Here are some things to look for to help you spot high-quality disc golf targets. Remember, if you’re looking for an ultra-portable option (like a foldable basket), you might not be able to find something with all of these features. This isn’t an issue – foldable baskets aren’t expected to perform quite as well as more traditional options – this is why they’re cheaper. PDGA approval, as we just discussed. If you can’t find something you like that’s PDGA approved, find a target that’s at least made to their build specifications. Chains made of metal, rather than plastic. Metal chains are less likely to break and do a better job stopping discs. Sometimes they’re coated in zinc which can further improve their durability. If playing competitively, get a basket that has at least 18-24 chains. This helps to prevent discs bouncing off the pole or slipping through the target. For casual players, the number of chains isn’t such an issue. If you’re looking for a portable option, go for something that’s sturdy but also fairly light. To save weight, it tends to be a good idea to go for a basket with fewer chains. These light-duty models often have nice wide bases which do a good job keeping them upright. A galvanized steel pole and chains. This helps to prevent the basket rusting or weathering in the sun. Some of the advice above isn’t really applicable if you’re prioritizing portability. For example, having 24 metal chains and a galvanized steel pole will make your target fairly heavy. Foldable targets, which are cheaper, lighter and smaller. Light-duty metal targets, which offer better overall performance, better durability and greater stability in windy conditions (they tend to have stronger bases). For family games at the park and pre-event practice, foldable baskets are great as they can fit in your car very easily and are a breeze to carry around. However, metal targets are better if you’re looking for something for your yard, as they tend to be more sturdy. Are expensive disc golf baskets worth the money? There’s two schools of thought here. On the one hand, more expensive baskets tend to be less portable. For some players, this is a big deal – most of us don’t have 9-hole courses in our backyard, so it’s good to have something you can take to the park. However, cheaper targets don’t offer very good performance when compared to more expensive options. You’ll experience more pole bounces and skimming, and the basket isn’t likely to be as stable, because cheaper targets have fewer chains. Ultimately, for serious players, it’s worth having a more expensive target. If you do decide to take it to an event for practice, it’s certainly possible to disassemble and transport these heavier options if you’ve got a vehicle that’s big enough to carry the parts individually. 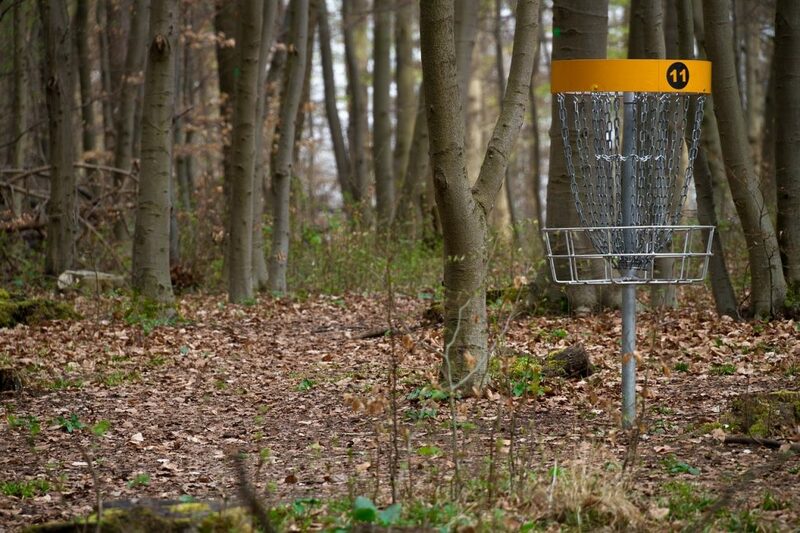 Buying a disc golf basket can be a tricky decision to make – after all, there’s so much choice! Just remember to consider how you’ll be using your target. 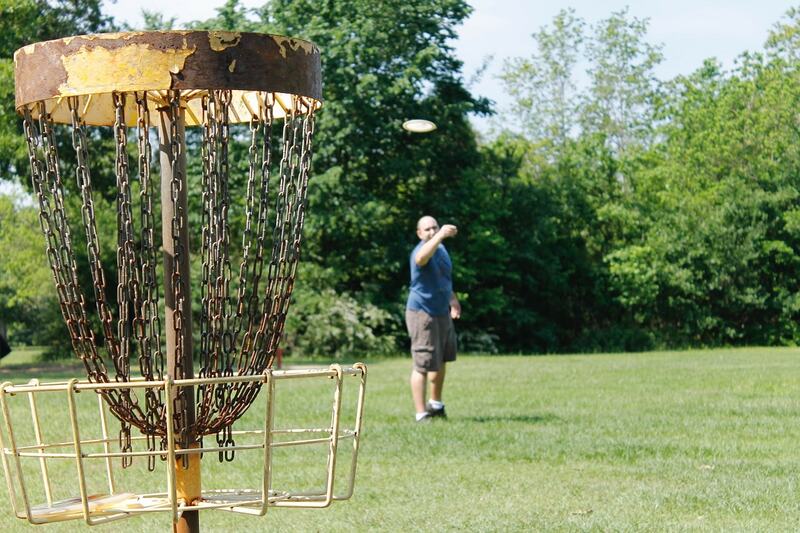 There’s no point buying a Championship basket if you began playing disc golf a week ago. If you’re still unsure, feel free to ask us anything in the comments below and we’ll get right back to you. Do you have a review or comparison on Latitude 64 ProBasket Trainer and/or MVP Black Hole Pro HD? We haven’t looked at the Latitude 64 line, but the MVP Black Hole Pro HD is an excellent option. As opposed to the normal Black Hole Pro, you get 30 chains rather than 24, and they do an excellent job preventing slip-throughs. It’s PDGA approved, and also very tough (suitable to be left outdoors), but you’ll have to pay a little more for it. On the whole, we think it’s worth paying the higher price for the HD version if you’re buying just the one – it’s not much more expensive. But if you’re looking to set up a full course and need to buy three or more baskets, the added cost can begin to stack up and become quite significant. Let us know if you’ve got any more questions!